I started full time in my position as Managing Director in May of 2016, I was a contractor for two months until the new fiscal year started in July and I could be brought on full time. At that point, the Center had a full-time staff of 2, me and Executive Director Ta Enos, and thankfully we had the support of numerous contractors that could help keep our programs and administrative work humming. Just two years later the Center’s operations have grown more than 400%. And although in those 2 years we have hit major milestones in the work of the PA Wilds, the businesses and organizations at the heart of the work aren’t aware of all that’s happening. Why? Because we (The PA Wilds Center) haven’t been keeping up with regular communications at the speed of the work. As we move through this next fiscal year it is a goal to perform more regular updates, scheduled to be posted on a monthly basis. Now, some might think “Cool, you put together some buzzwords – but what does it really mean?” It means that together with businesses across the region we are building a network of sustainability for our communities; it also means that having a common lexicon around our work will make communicating regular updates to our partners and stakeholders easier. To keep this update focused, I’ve broken down highlights and accomplishments by the main areas of the ecosystem framework. Value Chain – First off we established that the Wilds Cooperative (WCO) is a value chain network, done. WCO Scout Program – The demand for locally-made products and services is increasing (and will continue to – we have a goal to move $4 million in PA Wilds Made products from the WCO). 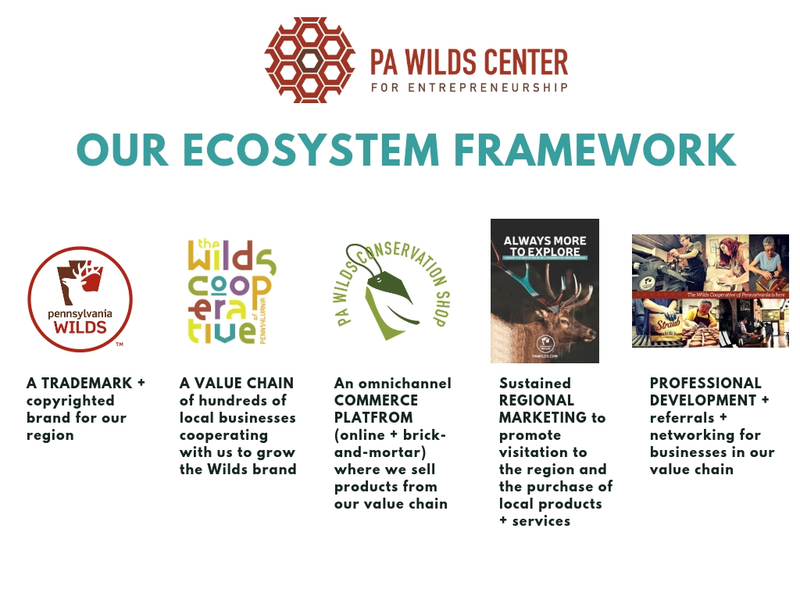 The PA Wilds Center is looking to contract with community-based businesses and organizations in seven counties of the Pennsylvania Wilds (Cameron, Clarion, Clearfield, northern Centre, Jefferson, Lycoming, Potter, and Tioga) to serve as Wilds Cooperative Scouts. Scouts will help to build, connect and cultivate the WCO Value Chain Network. Scouts will focus outreach to local producers and placed-based businesses that support and grow the work of the Wilds Cooperative and align with the PA Wilds Center’s growth goals. The RFP will post on September 28 and proposals are due November 2. Full details about this opportunity can be found here. PA Wilds Media Labs – I think this update is best delivered by video (production by WCO Creative Services Partner member Sixty Foot Films). You can also join us on October 11 for an Open House event, and get some basic background via this press release from Congressman Glenn Thompson’s office. And this blog post from Ed Byers is a great piece to catch up on development and revitalization efforts happening in downtown Kane. Creative Makers Exhibit– The Creative Makers project finished its second year, and showcases more than 200 images and 48 makers. The Creative Makers of the Pennsylvania Wilds – A Traveling Public Art Show raises awareness about the region’s creative community by bringing their stories to public spaces. This exhibit, which features regional artisans and producers making their crafts in their creative spaces, kicked off in 2017 by being featured at the Winkler Gallery of Fine Art (DuBois). In 2018, the exhibit traveled to the Elk County Council on the Arts (Ridgway), The Pajama Factory (Williamsport) and The Lumber Museum (Couderpsort) in 2018. Still to come, the exhibit will move in December to the Gmeiner Art & Cultural Center (Wellsboro), and it will be shown in Harrisburg at the Capitol Building East Wing Gallery in March 2019. We have applied for another round of PPA funding and hope to release an RFP in October to hire 3-4 more photographers to add more images to the exhibit. Commerce Platform – Last spring we opened our first pop-up shop, The PA Wilds Conservation Shop at the Lycoming County Visitors Information Center. Our products are in good company and we’re excited to have a presence in downtown Williamsport. 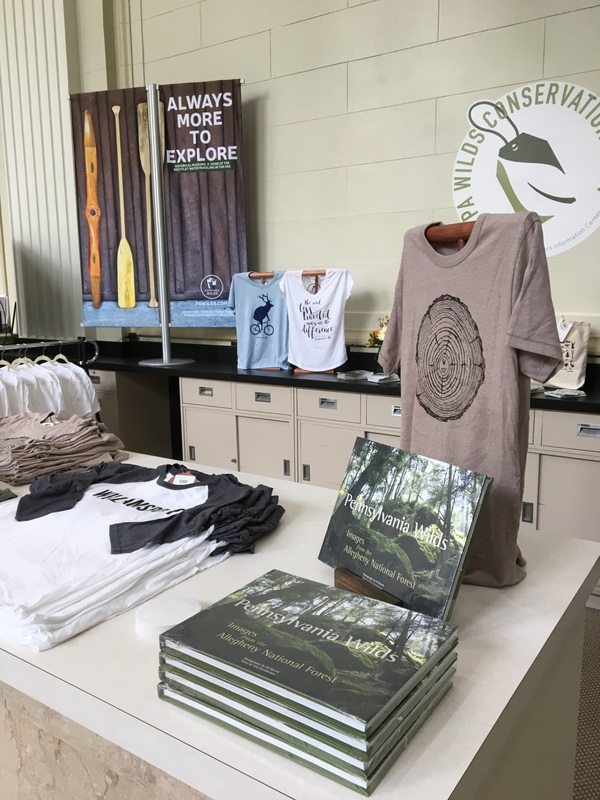 The PA Wilds Conservation Shop at Kinzua Bridge State Park celebrated the start of its 3rd year with a successful move to a larger space on the ground floor in the Visitor Center (read about the move and check out the new space here). The Shop has seen an amazing increase in sales (up 100% from the previous year), and the buying for this season has come to a close. Shop Manager Libby Bloomquist will return to buying for the shop again in spring 2019. Our team is gearing up to prepare for the Annual Buyer’s Market (March 2, 2019) at Clarion University. Registration to attend the event opens October 8, and producers and buyers alike are invited to join us for the event. For members of the WCO, don’t forget to keep your profile info up to date as we begin work on our Annual Buyer’s Guide (to be released January 2019). 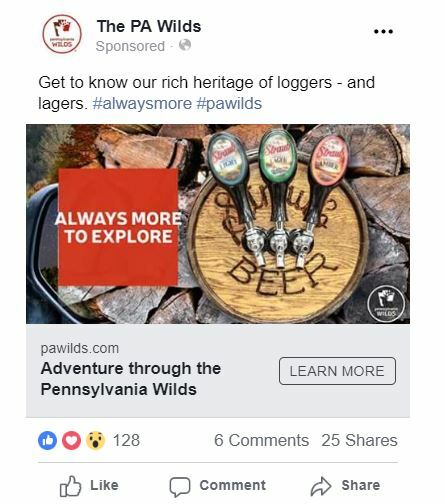 Regional Marketing – PaWilds.com was updated and relaunched in 2017 with the goal of inspiring and orienting visitors and we’ve seen a 146% increase in new users to the site since launching regional marketing in June 2018. While you’re here, I encourage you to explore the site – use it as a tool for employees (disproving any theory that there’s nothing to do around here), for recruitment of new employees or to get out and explore your backyard. We’re pulling together an amazing content team of guest contributors, known as WildsSPEAK. We hope the stories and images we’ve pulled together help visitors and residents fall (back) in love with the PA Wilds. Sometimes your work moves faster than the speed of communication. That’s how it can feel working for the PA Wilds Center. And that’s one of the many reasons I love the work I do. The next post may require tying myself to a chair long enough to write the update – but here at the PA Wilds Center, we are committed to communicating our successes, strategies, and opportunities so that together we can grow another 400%. My husband and I relocated from Los Angeles to Ridgway in 2007. We purchased a 10,000 square foot Georgian Federal building that had once been a grade school and we have been renovating it ever since. We were lured into the region by the building but we stayed for the boundless opportunities, beautiful scenery and strong sense of community. As Managing Director for the PA Wilds Center I am excited to bring my passion for our region to my job every day. Just got to this – great update Abbi!